The manufacturing of electrical and electronic appliances consumes energy and resources. Modern home appliances with built-in electronics contain metals such as tin, tantalum, gold and copper. In many cases, the mining of these raw materials causes major environmental damage and is linked to violations of fundamental human rights in the developing countries and emerging economies. Manufacturing a washing machine or other home appliance is energy-intensive and thus produces greenhouse gas emissions, which contribute to global warming. The disposal of these products is also problematical as they contain harmful substances which pose a risk to the environment and human health; these risks are particularly severe in the developing countries and emerging economies. Keeping home appliances in service for longer can generally help to minimise these harmful impacts on the climate and the environment. In 2016, the Oeko-Institut conducted various studies on obsolescence, which showed that strategies to discourage people from discarding their appliances prematurely are a task for the whole of society and will only be successful if policy-makers, manufacturers and consumers work together. But policy-makers and industry still have much to do; this includes establishing a better repair infrastructure, setting minimum product quality and durability standards, creating more effective statutory and financial safeguards, such as legal warranties and guarantees, and offering tax relief on long-lasting, easy-to-repair products as a measure to counter premature obsolescence. 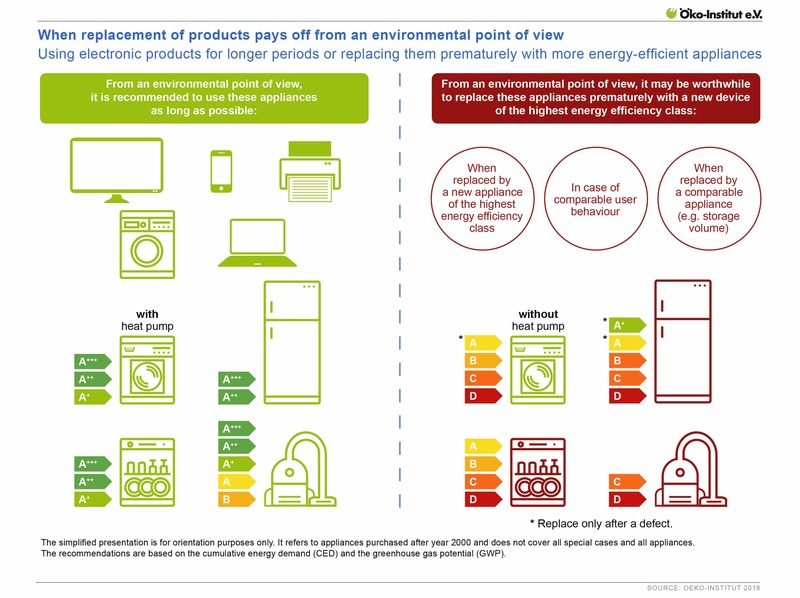 However, consumers also have a role to play: by choosing long-lasting, easy-to-repair products, they can actively shift consumption patterns towards more sustainability. How can appliances be kept in service for as long as possible? When are they worth repairing – and when does it makes sense to buy a new and efficient appliance? The Oeko-Institut provides answers to these questions in the new background paper „FAQ Extending the life span of home appliances“.